Marianne Brish Evett wrote this description of her days as a bookmobile driver in the early 1950s. It was written as a theme in freshman English at Randolph-Macon Women's College. She was encouraged to expand and polish it for the college Prose and Verse, an annual anthology of the best student writing. The library republished it. 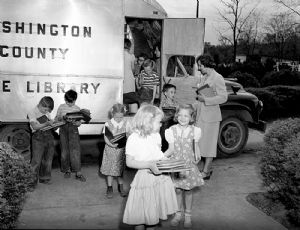 Then I worked summers on the bookmobile from 1950-52 (I think). It was a terrific job; I got to drive now and then (learned to double clutch to shift gears). There was, indeed, room for three (barely): Helen Margaret Cooper and Dorothy Whitmore and me. We all got along well, joking and talking as we jolted along. Click on the PDF icon to read the description. Used with permission of Marianne Brish Evett and Randolph College, Lynchburg, Virginia. Marianne suggested the photograph shows one of the early runs to schools in April or May of 1950. "It looks like a class to me, and not a crowd during the summer months."